How many hours of sleep have you lost over money problems? Life today is nothing like it was a few generations ago. Back then it was much easier to purchase a vehicle, or even a house, straight out. Now both usually require a loan in order to acquire them. We have also transformed from a “cash is king” society into one that values plastic a great deal more than it ever has before. It is so easy to rack up debt, however, that the average consumer often finds themselves in much more debt than they ever planned on. But how can you find debt relief when you feel as though you owe so much money that you will never be able to get on top of it? No matter how much money you owe to your creditors it is important to remain calm. While it’s very easy to feel overwhelmed, panicky and mad, these feelings will not help you to erase the debt from your life. On the contrary, people who focus more on the negative feelings that they have about their debt issues often wind up accumulating more debt, believing that by ignoring the problem it may just go away. This is definitely not the case. If you are concerned about your financial situation, working with debt relief experts is one of the easiest and most straightforward ways to eliminate the debt from your life. Not all debt relief companies are created equal. Fast Track Debt Relief works for you and is committed to helping you find a streamlined way out from under a growing pile of bills and payments. 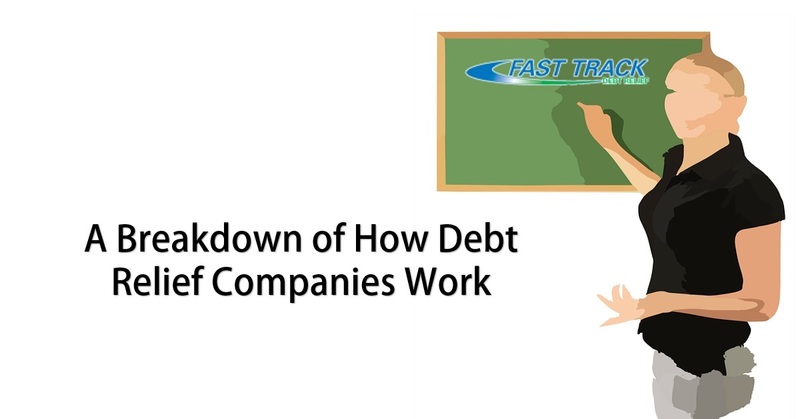 The experts at Fast Track Debt Relief do nothing other than to counsel their clients about their debt issues. There is simply no other agenda. These experts know all of the ins and outs of financial debt issues and every single trick of the trade that there is. They can help a client achieve debt relief and financial freedom in a number of different ways. They recognize that every client that they have has a different financial and living situation, and that there is no cookie cutter option that works for every client in debt. Before you can find relief, it’s important to know how in debt you are. It’s actually a bit surprising for many people to discover that they are much more indebted to various credit card and loan companies than they ever thought they were. Your debt counselor can not help you if they do now know all of the debt that you have accumulated. Be prepared for your first meeting by gathering together all of your monthly bills. You can also contact the credit card company to ask them how much you owe and what your payoff amount is. Get all of this information together before your first consultation. Make sure that you bring all of your files with you for your first consultation with your debt relief counselor. Make sure that you are completely honest with the consultant that you work with. It’s easy to feel embarrassed when you speak with your expert, which is often the reason why many people opt to not reveal the true depth of their financial debt. You shouldn’t feel embarrassed! Many studies agree that 8 out of 10 Americans are in debt so you are definitely not alone! Keep in mind that the only way that your expert can help you is if they know the full amount that you owe, so make sure that you are 100% honest. When you leave your consultation you will have a plan in hand, ready to be started. The good news is that there are a number of options to select from that can help you to get rid of the bills hanging over your head. It is advisable to let your expert walk you through all of the available options which may include strategies like decreasing your monthly bills to help pay off your debts, or having your monthly payment put in escrow for a time being to allow it to build up interest while your debt relief expert works to lower your payments. Often the expert will be able to consolidate the debts into one much lower payment, which is generally much easier for clients to handle. It’s important to make sure that you fully understand your plan. If you simply nod your head and agree to whatever they suggest, without understanding how the entire process works, you’re much more likely to either not complete the plan or you are likely to get back into debt soon after you have gotten a handle on your current situation. Don’t feel ashamed to ask questions until you fully and completely understand exactly what the plan to lower your debt entails. Finding financial freedom in today’s fast paced, debt-happy world can definitely be difficult. This is why it is so important to make sure that you contact debt relief companies like Fast Track Debt Relief the minute you realize that you are in serious debt. The sooner you tackle the problem, the faster you will be able to relax knowing that your debt issues are a thing of the past.